A week from tonight I will be in Saint Paul, Minnesota. I am headed back for a couple of reasons, one of which is to co-present with another author at Subtext Books. 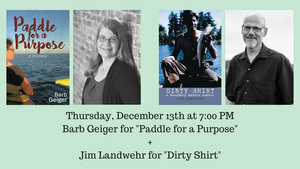 Barb Geiger and I will be presenting our books, Dirty Shirt: A Boundary Waters Memoir and Paddle For A Purpose. This promises to be a fun event as we discuss our adventures on, off and IN the water. Most of you know that Dirty Shirt chronicles trips I took up to the area in remote Minnesota with friends, brothers and, later, our children. Barb's book has a similar adventure theme to it. It is the story of how her husband's idea of paddling the length of the Mississippi River went from an half-joking crackpot idea to the actual pursuit of carrying it out. But their journey takes on a noble purpose when they decide to volunteer for service projects at various stops along the way. While the boat carries just what they need to live on, at many of the stops, they put their hands and feet to work for non-profit and church-based agencies. During the process they discover that in trying to bless others with their work, they in-turn are blessed. One of the ways this manifests itself is in the form of what they call "River Angels." These are complete strangers who open up their homes and offer food, money and resources to the Geigers as they progress. These angels seem to come along at opportune times and make the trip easier to bear for Barb and her husband. When Barb was writing her book, she was part of the same writing studio (AllWriters) that I was. I was fascinated to follow her progress as she got closer to finishing it. At submittal time, she asked if I thought it would be a good fit for my publisher, Electio Publishing. I replied that I thought it would be a PERFECT fit. Electio accepted her book and Barb was ecstatic. I had the privilege earlier this year to speak at Subtext Books for my second memoir, The Portland House. I am hoping we will pack the store and have a good showing of support. Small bookstores make a community more vibrant and Subtext is proof of this. The format for the evening will be loose. There will be introductions, readings from our books and short interviews of each of us regarding the writing process and how our books came to be. Then we'll open the event up to questions from the audience. Of course we'll have books to sign afterwards. And nothing makes a better holiday gift than a book signed by an author. But that's just my opinion.